The Epic of Gilgamesh is the oldest surviving literary work in the world. Repeated on cuneiform tablets and on reliefs for thousands of years, the story is based Gilgamesh, the real life King of Uruk, a city in Mesopotamia, who is believed to have lived sometime between 2800 and 2500 BC. 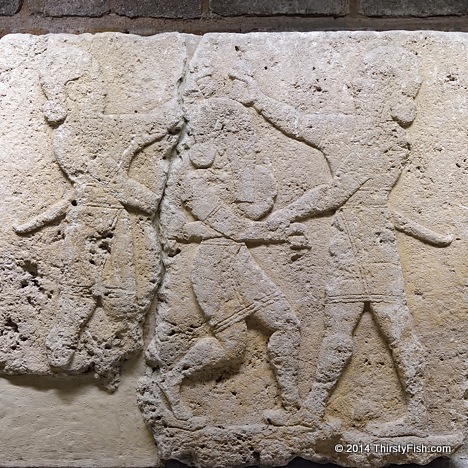 The pictured Neo-Hittite relief is from 900-700 BC depicting Gilgamesh and his best friend Enkidu killing Humbaba, the guardian of the Cedar Forest. It is said that the Epic of Gilgamesh, the oldest story ever told, is the foundation of every story ever told since; A lonely and bored king finally befriends someone who truly understands him. With his friend, he goes on an adventure to kill the monster-protector of the forest so that he can build his city with the timber from the forest. And after he tragically loses his friend, he sets off on a hopeless journey to find the secret of immortality. Tragically, have been following the example of Gilgamesh ever since. Much like G, we have built civilizations through the destruction of environments. Once we kill Humbaba, the protector of the forest, and build our cities, we are forced to move on to the next environment since a denuded forest is no longer a source of life. But there is nowhere else for "civilization" to move on to. And, in the very near future, we will discover - just like Gilgamesh did - that we as a species are not immortal; We should never have killed Humbaba! Photographed at the Museum of Anatolian Civilizations in Ankara.